Following today’s game the TORONTO BLUE JAYS have selected the contract of 3B BRETT LAWRIE from Las Vegas (AAA), recalled LHP LUIS PEREZ from Las Vegas, placed RHP CARLOS VILLANUEVA on the 15-day disabled list with a right forearm strain and have optioned OF TRAVIS SNIDER to Las Vegas. LAWRIE, 21, has hit .353 for Las Vegas of the Pacific Coast League (AAA) with 24 doubles, six triples, 18 home runs and 61 RBI. The 6-0, 215 lb. native of Langley, British Columbia, Canada also appeared in four games with Dunedin (1-8, 1 RBI) after returning from the disabled list. He suffered a broken left hand after being hit by a pitch on May 31 vs. Tucson. 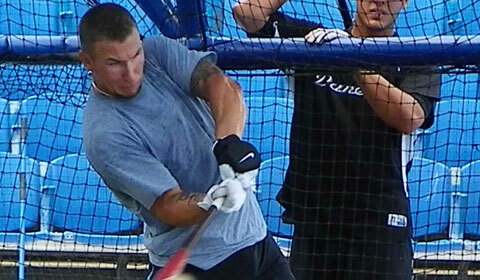 Lawrie, who was the 16th player selected overall in the 2008 First Year Player Draft by Milwaukee, was acquired by Toronto on December 6, 2010 in exchange for RHP Shaun Marcum. PEREZ, 26, has appeared in 24 games with the Blue Jays this season and has posted a 1-2 record with 3.57 ERA. The 6-0, 210 lb. left-handed pitcher has started eight games for Las Vegas this season posting a 2-2 record with an ERA of 4.60. In those starts has allowed 37 hits with 43 strikeouts in 45.0 innings pitched. SNIDER, 23, has split the 2011 season between Las Vegas and Toronto. In 49 games with Toronto the 6-0, 230 lb. left handed hitter has posted a .225 average with 14 doubles, three home runs and 30 RBI. In 49 games with the 51s, Snider is batting .333 with 21 doubles, two triples, two home runs and 29 RBI. VILLANUEVA, 27, is making his first appearance on the disabled list after suffering from a right forearm strain. The 6-2, 225 lb. right-handed pitcher is 6-3 this season in 26 games, 13 starts, with an ERA of 4.24. Since joining the starting rotation on May 23 he has posted a 5-3 record with a 5.15 ERA.